There's nothing like a good hike when you need to get away from it all. We've got tons of great hiking in the Capital Region, but for those times when I can't spend all day out on a trail-- when I want to stretch my legs, clear my head and be home for lunch-- I head to the Indian Ladder Trail at Thacher Park. 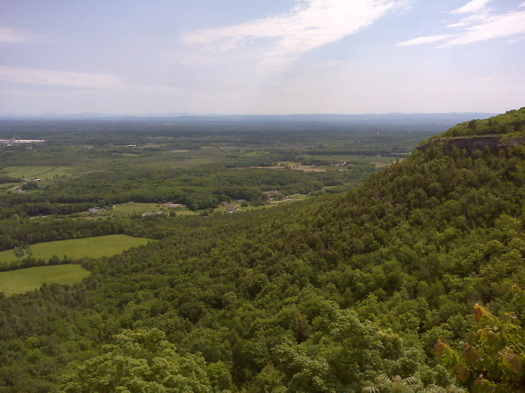 John Boyd Thacher Park is just a short drive from downtown Albany and is a great quick escape from the city. There's a beach, playgrounds and great views, but I really love the Indian Ladder Trail. The trail has a lot of cool history. 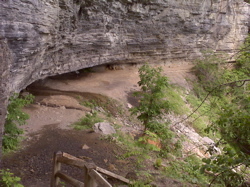 It was built by the Schoharie Indians along the Helderberg Escarpment as a trading route. In order to scale the particularly steep cliffs on the trail, they built an actual ladder. Acrophobics, have no fear you don't have to shimmy up a ladder on a steep cliff. These days you climb a sturdy metal staircase instead. It isn't a challenging hike, but you'll walk away feeling refreshed and limber. The view is great, but there's also lots of cool stuff to see on the trail itself. 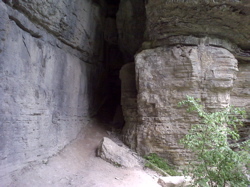 Geologists say it has the world's oldest exposed limestone and one of the world's best fossil bearing formations. You'll pass under waterfalls and over a stream (wear old, but sturdy shoes!). Bring along a flashlight and explore some of the caves you'll pass along the way; they also act as a natural cooling station on a hot summer day. Indian Ladder Trail is dog and child friendly, but remember that New York State Parks are carry-in, carry-out -- so you'll have to take any trash home with you. You can do the whole trail and be on your way home in about two hours. Be sure to wear long sleeves and pants, but if you can't bear to do that on a 90 degree day, check yourself (and your pooch) for ticks afterward. Wait- beach? Where's the beach? I have many fond memories of Thatcher Park, namely of climbing up to areas I wasn't supposed to be in and getting yelled at by park rangers. Those stairs at the end are also a good little workout. This really is a fun thing to do that doesn't take up loads of time or require much advance planning- we always go on a whim and come home happy. Are those signs new-ish? I've taken my pups on that trail numerous times and never noticed them before ... and have often seen other dogs on there too. No beach, but it looks like someone noticed that and crossed it out. The beach is up the road about a mile in Thompson Lake State Park. You can walk from Thacher to the lake via a trail system past the Nature Center if ambitious. jess: as far as i know the signs have been there for years... i started going up there on a regular basis about 3 years ago when i moved to delmar. that being said, i've seen dogs on the trail too, so i don't think they are too strict about it. i've never taken my dog cause she's a little rowdy, and with my luck would pull me down a cliff after a squirrel. haha. Dare I say it, but there are even better trails that follow the escarpment a bit further out - the trail heads are at Carrick Rd and another road whose name escapes me...(out of the park, turn right onto the nameless road just past the "Shady Lady" open air market sign). This land is co-owned by Thatcher and the Open Space Institute - nice rocky singletrack trails that lead out to nice overlooks above the Altamont fairgrounds. If you're lucky, you may even be able to catch a few people jumping off from the hanglider cliff (with aforementioned gliders, of course). Nice hiking and mountain biking. @James: I know what you're talking about...I used to walk those trails back in the day but now I can't remember how to get there. The other one is called High Point, I believe. 61+ years old, overweight, have a "thing" about heights, yet, I walked/climbed the trail last Sunday afternoon from beginning to end. Yea! Life is beautiful! I'm going back again next summer. Woohoo! Governor Paterson is going to close the park! But we're not going down without a fight!! Come follow the cause and post your memories and pictures to our facebook page. Tell the Governor why you love Thacher and why he can't close it!! My husband and I went to Thatcher Park Indian Ladder Trail yesterday, 7/6/13 without warning of the most treacherous trail ever! I don't know what those people were smoking or drinking when they wrote reviews of fun and ease of this trail! I was stepping so carefully and hanging on for dear life, each rick formatiin or twig that I came across! I will not be returning, of which I' m sure other hikers are clapping about! My husband does not share this conment with me! He was exhillarated! And that was after having a stent placed in his RCA if his heart 3 wks ago! Saving the day was a lunch with their creamy homemade icecream at The Tollgate Diner! OK, I'm not your avg hiker! We just returned from the Indian Ladder Trail. We live nearby, but had never hiked it. Our kids are 10, 7 and 3. The 10 year old did fine, with reminders to stay away from the edge, and to avoid the temptation to climb all of the tempting ledges. The 7 year old was a little scared at times, and held my hand on the steep parts. However, the 3 year old was a nightmare, and spent the hike on my husband's shoulders. In my opinion, this is not a kid-friendly hike for kids under the age of 5. Even then, I wouldn't want to take an impulsive daredevil. Beautiful views when I wasn't clutching my kids with white knuckles. I've always loved the trail itself, but I will admit the stairs to access it terrify me. Has anyone been in the cave with a stream coming out of it (there's a bridge over the stream you can cross)? It's about halfway through the Indian Ladder Trail maybe. I kicked off my shoes and socks and went as far as I could on hands and knees with just my phone as a flash light but couldn't get any further past the Y without a head lamp lest I submerge my phone. Now it's on my to-do list next time I go back.